TOUCH/STONES is about the point of contact. A connection. A person picks up a stone and places it on another stone, and there is evidence of their having been at the spot. A cairn on a granite mountain. A wall on a limestone and shale island. A tomb, a portal, a stile. A ritual, an offering, a game, a path. As I sat on a granite outcrop after hiking to the top of one of my favorite mountains in New Hampshire, my gaze moved from a breathtaking 360-degree panorama to focus on the stone trail markers nearby. Marks left by those who went before to indicate the path for those who would come after. These cairns have been part of my life since childhood, images engraved in my mind together with protocol for safety and etiquette along the hiking trail. On this particular day with my camera hanging from its strap around my neck, I thought to capture the cairns on film. But as I studied the magnificent structures, assembled and reassembled over time, they seemed to call for a more meditative approach. I reached in my pack and found a pen. The only papers were some artist postcards, souvenirs from my last museum visit. So be it. 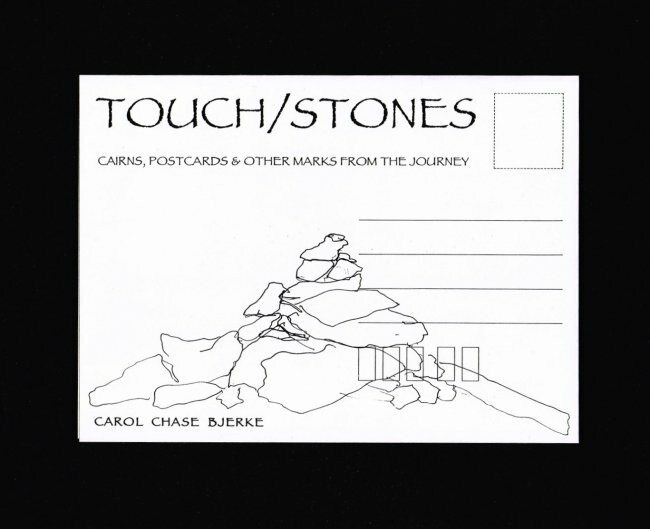 Intent on pursuing my current motive, I spent the next hour or so making contour drawings of several of the stone formations, ignoring the postcard imprints already occupying the paper surface. Only later did I acknowledge the fortuitous relationship between the lines of my drawings and the lines and text of the postcard layout. Later still did I realize its formal and conceptual potential for the TOUCH/STONES project. A person sends a postcard from a place, and there is evidence that the person was there. The journey extends to far-reaching experiences, and then returns to the studio. A lesson learned from ancient stones in Ireland has to do with how little contact there needs to be between one heavy piece and another if they are well-placed. In other words, there is a lightness at the point of contact that defies the heaviness of the materials. In addition to photographic images printed from film negatives in the usual manner, two alternative methods are represented here. Terms used to describe these processes are derived from the root word limn, meaning "to draw or illuminate." 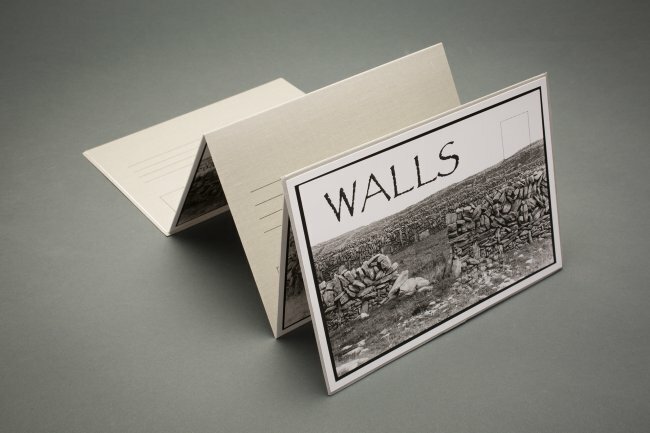 Limnoprint is a means for reproducing the postcard drawings and other line art and text. It involves several stages resulting in contact-size negatives from which the editions of prints are made on gelatin silver photo paper. Limnograph indicates a unique image made by drawing with photographic developer directly onto exposed photo paper. There is uncertainty and touch of magic about the manner in which the fluid interacts with the emulsion on the surface of the paper. "Rubbed with the chemistry of desire," says the poet. I made this mark says the artist. I connect to this image. It is my offering. I am here. For more images, click on next.